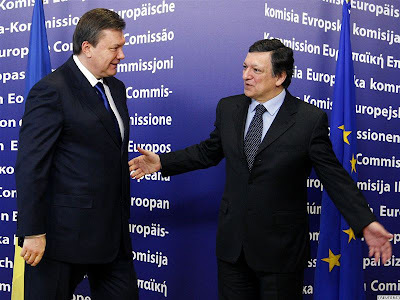 BRUSSELS, Belgium -- Since the election of Viktor Yanukovych as president of Ukraine at the beginning of this year, the country has been very much back on the agenda in Brussels. Ukrainian President Viktor Yanukovych (l) has become a regular visitor to Brussels. The new president and members of his government have become regular visitors to the Belgian capital. To the surprise of many European observers and contrary to their public image in most European countries as politicians who want to bring the Ukraine closer to Russia once again, the government has repeatedly stressed that its strategic long-term goal remains accession to the European Union. The fact that Mr Yanukovych's first foreign visit was to Brussels, not Moscow, was a clear signal of this. The president was very outspoken during a public meeting in France at the beginning of October where he said: "Ukraine will never give up the policy of European integration ... After all, the European idea has become the universal unifying motif for the Ukrainian society. Therefore, I personally believe a united Europe is and will be the best response to the challenges of the present day." The previous government - which did not suffer from the reputation of being pro-Russian - repeatedly stressed its engagement to the strategy of European integration. But during the five years of Mr Yushchenko and almost three years of Yulia Tymoshenko's government, not much progress was made. The constant fights between the government and the president had a disastrously negative effect on many good intentions of the 'Orange Revolution' as a movement to bring a process of change to Ukraine, including the process of reforms necessary to bring Ukraine closer to integration with the European Union. It may, therefore, seem understandable that many foreign observers are questioning if this new 'pro-Russian' president and his government can succeed where their 'pro-Western and pro-European' predecessors were not able to achieve real progress over the past five years. It is true that President Yanukovich and his government have not made the European integration process the sole priority of Ukraine's foreign policy. They have also made a great effort to once again normalise relations with their other big neighbour, the Russian Federation. This was an absolute necessity for the country after the 'gas wars' with Russia which seriously destabilised the economic situation in Ukraine. But stabilising relations with Russia was also to the long-term advantage of millions of households in the European Union which were already once - and not so long ago - threatened with a very cold winter because of these bad relations between Russia and Ukraine. Instead of depicting the current leadership of Ukraine and their Party of Regions as pro-Russian and, therefore, doubting the sincerity of their European ambitions, it would seem more appropriate to identify them as simply pro-Ukrainian and to support them in their wish to seriously make progress in all aspects of European integration. Because it must be clear that Ukraine - like Poland or Romania at the time - will need strong support from its European partners to advance on the very complex path of further integration with the European Union. This also means that the Party of Regions and the current government are given a real chance to prove their willingness and ability to make progress on this important issue. The Group of the Progressive Alliance of Socialists and Democrats in the European Parliament has, after careful preparation and a few years of thorough discussions with the leadership of the Party of the Regions, taken the decision to - as it is described in the Memorandum of Co-operation which was signed on 14 October 2010 - "further develop and intensify the contacts between our organisations with a view of supporting the Party of the Regions' ambition to strengthen the Ukraine's integration process towards the European Union and to further reinforcing the S&D Parliamentary Group's support for this ambition." This memorandum must be considered as an expression of a wish of one of the biggest political groups in the European Parliament to take the responsibility of working together with the biggest party of Ukraine to bring their country closer to the European Union. This means that we will jointly organise seminars and meetings on topics which are of practical importance to further Ukraine's integration process towards the European Union; that we will organise meetings and round tables on political co-operation, parliamentary procedures in the European Union and the strengthening of political participation. We will create the possibility of traineeships for young leaders from the Party of the Regions with the S&D Group in the European Parliament, and that we will together establish a mechanism to jointly monitor and evaluate the implementation of EU/Ukraine Agreements and the progress of the reform process which is necessary for the effective and full implementation of these Agreements. It must be emphasised that this cooperation will certainly be to the benefit of the political work of the Party of Regions but it will equally be to the benefit of the European Union as a whole to help the Party of Regions to be a reliable partner in Ukraine's European integration process. This does not mean that the S&D has now welcomed the Party of the Regions as a member of its political family, like the EPP did in 2007 when it included both the Our Ukraine Movement of former president Yushchenko and the Fatherland Party of Yulia Tymoshenko as parties with an observer status in their political movement. The memorandum that was concluded between the Party of Regions and the S&D Group in the European Parliament is not a declaration of ideological affiliation; that would be too early for both groups. Nevertheless, it is hoped that their cooperation will also encourage the Party of Regions to stand up for and to defend the values of social democracy in Ukraine, thus meeting the expectations of the overwhelming majority of its electorate who cherishes social solidarity and social justice. This memorandum gives us also the possibility to "create a forum for a frank and open discussion about the political situation in Ukraine and to assist the Party of the Regions in their wish to overcome the current situation of serious party-political confrontation and to establish a climate of democratic cohesion in Ukraine, including the strengthening of the democratic institutions and rule of law as well as the further free development of the media," as the memorandum states. One must only wish that other European political movements would create a framework for a similar critical dialogue with their partners in Ukraine. Because it is almost shocking to see how some EPP Members of the European Parliament uncritically take on board the political slogans from the Ukrainian opposition, thus importing the Ukrainian mud-fighting in the European political arena instead of trying to establish a democratic political cohesion in Ukraine. It is now up to the S&D Group in the European Parliament and to the Party of Regions in Ukraine to transform this memorandum for co-operation into effective action to the benefit of Ukraine and to the benefit of the European Union.